Established by law in 1850 as intersection of 100-degree longitude and 36-degree, 30' latitude, this point remained in dispute 79 years. Of some nine surveys made to locate corner on ground, almost none coincided. 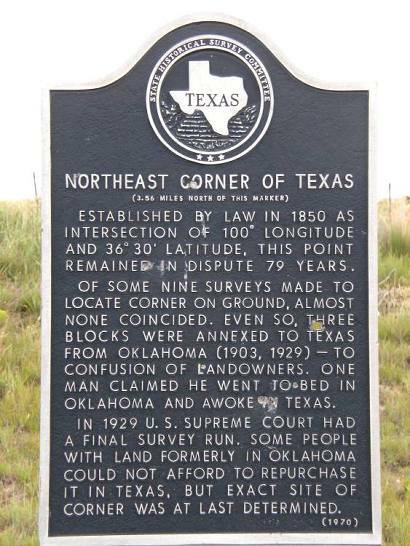 Even so, three blocks were annexed to Texas from Oklahoma (1903, 1929) - to confusion of landowners. One man claimed he went to bed in Oklahoma and awoke in Texas. In 1929 U.S. Supreme Court had a final survey run. Some people with land formerly in Oklahoma could not afford to repurchase it in Texas, but exact site of corner was at last determined.